It was the night that proved Television and streaming services are much better platforms for increasing diversity in entertainment. The 2017 Emmy Awards notched up some major wins for women and minorities, and also saw some important barriers being broken. If you are yet to watch ‘Master of None’ on Netflix, we suggest you get on that because it has become a breakout show for a number of reasons, most prominently because it is a vehicle for diverse stories that are usually excluded from mainstream entertainment. 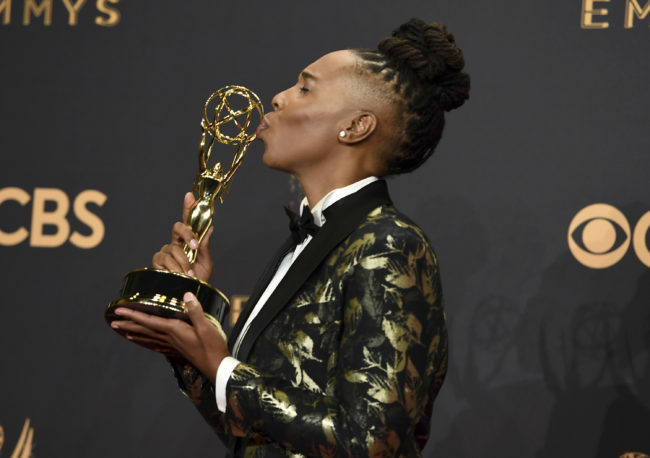 And this focus is paying off, because Lena Waithe, pictured above, became the first black woman to win an Emmy for Comedy Writing at the awards. The of course stars in the series as Dev’s best friend (played by show creator Aziz Ansari) and won the award specifically for Season 2’s Thanksgiving episode which delves into her characters journey as a young queer woman, coming out to her mom (played by Angela Bassett) throughout the years. In her acceptance speech, Lena wasted no time talking about the significance of her win, paying homage to people in the LGBTQIA community. “I see each and every one of you. The things that make us different, those are our superpowers. Every day when you walk out the door and put on your imaginary cape and go out there and conquer the world… because the world would not be as beautiful as it is if we weren’t in it,” she said. As Buzzfeed reports, Lena has been championing the aforementioned groups in public, most notably since her nomination where she spoke about the importance of visibility and mentoring other diverse writers. “I’m definitely really involved in mentorship…I think the biggest thing is to make sure that people of color have some guidance and some mentorship to help them get to that place. Otherwise, they don’t get in those rooms. Or they get in the rooms and they fail. That’s problematic. So I’m just sort of actively trying to help make sure people have opportunities,” she said on a panel for GLAAD. 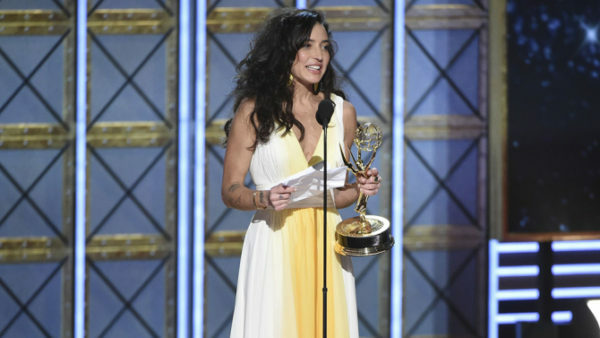 Another woman who broke a major barrier at the Emmys was director Reed Morano, who became the first woman to win an Emmy for Drama Directing in 22 years. At a time when there is increased scrutiny about the lack of female directors in Hollywood, this win was especially noteworthy. Reed, whose work on ‘The Handmaid’s Tale’ was lauded by industry peers, had never directed a pilot before this show, yet she directed the first 3 episodes proving women’s work behind the camera is a win-win situation. Speaking of ‘The Handmaid’s Tale’, the series, which fictionalizes a future America where women’s rights and reproductive choices are completely controlled by a religious government, was the big winner of the night, taking home the award for Best Drama Series and a total of eight awards. Along with ‘Saturday Night Live’ winning 9 (the most for any show on the night) there was undoubtedly a very political message about the 2017 Emmys. Both Alec Baldwin and Kate McKinnon won for their portrayals of Donald Trump and Hillary Clinton respectively on the on the comedy show. 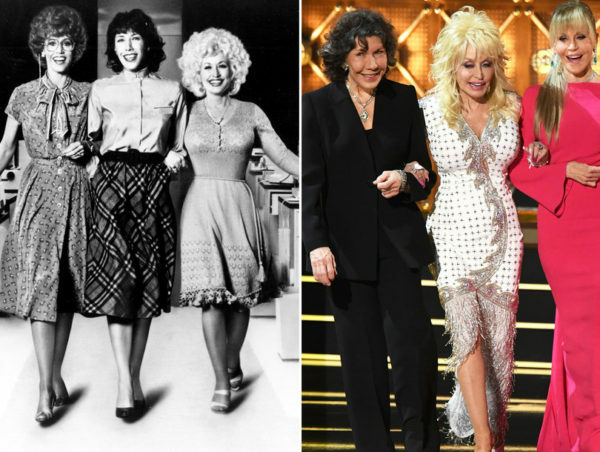 Singer Dolly Parton along with actresses Lily Tomlin and Jane Fonda (who star in Netflix’s ‘Grace and Frankie’) took to the stage for a reunion of their hit film ‘9 to 5’ to deliver an important political message. “Back in 1980 in that movie, we refused to be controlled by a sexist, egotistical, lying, hypocritical bigot,” said Jane. “And in 2017, we still refuse to be controlled by a sexist, egotistical, lying, hypocritical bigot,” added Lily, a statement which received rousing applause from the audience. HBO was the network that notched up the most wins of the night, most notably for its female-driven and executive produced show ‘Big Little Lies’ and political comedy ‘Veep’. 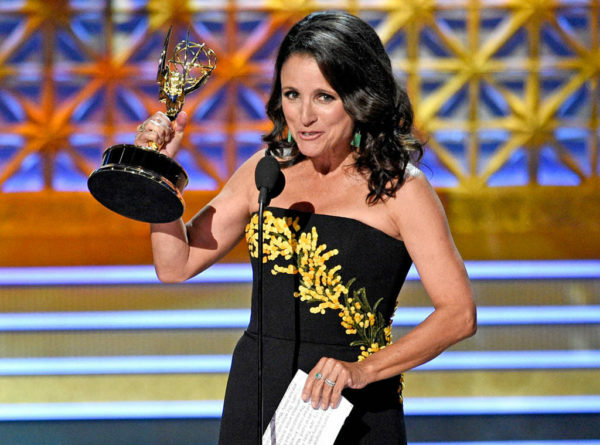 In fact, actress Julia Louis-Dreyfus made Emmy history by earning her 6th consecutive win for best actress in a comedy category placing her in the history books for most Emmys won by a single performer for one role. She’d previously been tied with Candice Bergen, who won five times for playing Murphy Brown and now her win has her tied with Cloris Leachman, who before Sunday held the record for most Primetime Emmys wins by a single performer. Julia said playing former president Selena Meyer was the “role of a lifetime and an adventure of utter joy” before making a joke about a potential story line. ‘Big Little Lies’ won for Best Variety Series, and saw actress Nicole Kidman win for Best Actress in a Limited Series and Laura Dern win for Best Supporting Actress. In her acceptance speech, alluding to her character who is a victim of domestic abuse by her husband, Nicole used her her stage time to talk about the often hidden issue of domestic and intimate partner violence. “It is a complicated, insidious disease. It exists far more than we allow ourselves to know. It is filled with shame and secrecy. And by you acknowledging me with this award, it shines a light on it even more,” she said. Laura Dern emphasized a message of female empowerment in her speech, hinting at the wave of women in Hollywood who are sick of waiting for equality and are instead taking the reigns on creating their own TV shows and films. “Thank God we’re seeing more and more women…It’s changing dramatically…It’s a beautiful time to be female and to be raising a 12-year-old girl,” she said. Both Nicole and Reese Witherspoon who executive-produced ‘Big Little Lies’ later accepted the award for Best Limited Series, and spoke of the need to center women in more content. “It’s been an incredible year for women in television…Bring women to the front of their own stories and make them the heroes of their own stories,” said Reese, whose production company Pacific Standard Productions has won multiple awards across film and TV since its inception. But it wasn’t just the women who broke barriers on the night, as there were also a couple of important wins by men of color. 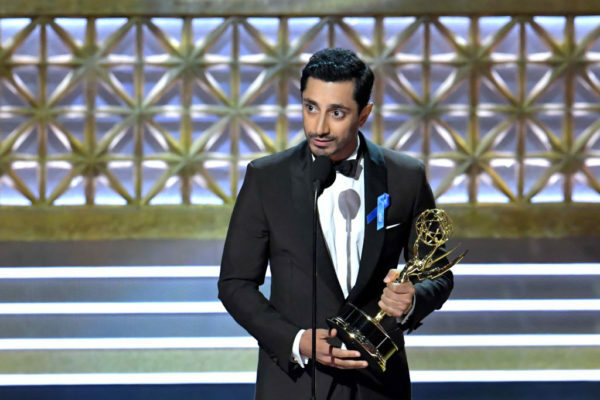 British-Pakistani actor Riz Ahmed won for Best Actor in a Limited Series for his role on HBO’s ‘The Night Of’. As someone who has previously been very vocal about diversity in mainstream entertainment, while speaking to reporters he continued this advocacy. “TV is in particular a global medium. People are streaming shows or watching them all around the world, so hopefully we’re going to see a globalization of the stories we’re telling and a globalization of the talent pool,” he said. On stage, he also added that he hoped the series would shine a light on the injustice of the justice system in the US, especially toward black and brown men and women. 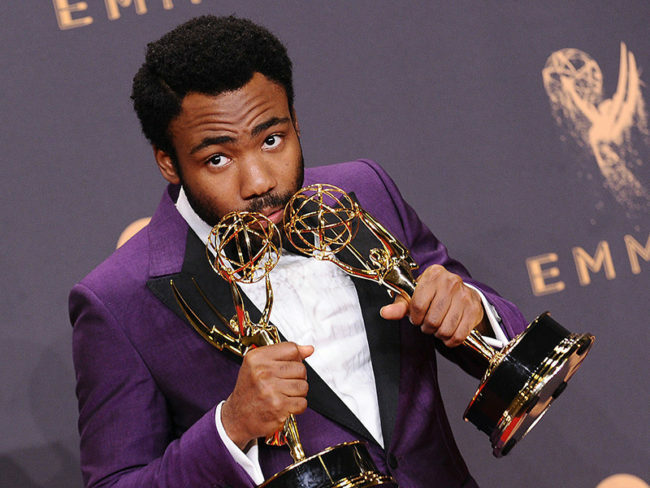 Actor and comedian Donald Glover, creator of FX’s hit show ‘Atlanta’, made history by becoming the first black person to to win an Emmy for work on a comedy series, and the first black man since 1985 to win an Emmy for lead acting in a comedy series. He took home awards for Outstanding Lead Actor in a Comedy Series and Outstanding Directing in a Comedy Series. In his speech he showed his comedy chops and thanked an unlikely source of his win. “I want to thank Trump for making black people number one on the most oppressed list. He’s the reason I’m probably up here,” he said. It was certainly a night to remember as it sent a major message to powerful decision-makers in Hollywood: diversity is a winning strategy. While there is certainly a long way to go, as Vogue.com points out there was a glaring lack of Latinx presence among the winners and nominees this year, it’s exciting to see the progress being made. Here’s hoping the industry trend will soon move toward diversity being the standard, not an anomaly.